Diplomatic and military sources say Niger President Mamadou Tandja has been seized by mutinous soldiers during a coup attempt in Niger's capital. Media reports quoting senior officials say armed troops stormed the presidential palace Thursday afternoon as a meeting of government ministers was taking place. Ministers in Mr. Tandja's government also appear to be held captive. A U.S. State Department spokesman said it appears there was an assassination attempt on Mr. Tandja but details are still unclear. Earlier in the day, smoke could be seen rising from the palace and witnesses reported heavy gunfire and explosions. State radio suspended broadcasts and later began playing military music, similar to two previous coups in Niger in the 1990s. 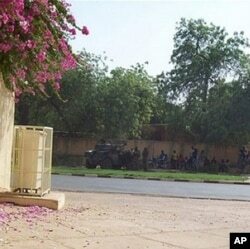 Soldiers and armored vehicles were seen near the palace and nearby streets were deserted. Hospital officials say at least three soldiers were killed during clashes. An African Union senior official, Ramtane Lamamra, expressed concern about the situation and said the AU was closely following what is going on. Last year, President Tandja held a referendum to change the constitution and extend his rule, which had been due to expire at the end of 2009. When Niger's parliament and constitutional court said the referendum was illegal, President Tandja dismissed both and ruled by decree. In response, the European Union and United States imposed restrictions on Mr. Tandja's government and stopped some development aid. The Economic Community of West African States has also suspended Niger.